The American Bow Tie Manufacturing Association announced yesterday that it is disbanding. ABTMA President Larry Fuller said that the organization has only one manufacturing concern, Larry Fuller Bow Ties, as a member. The ABMTA contacted bow tie wearers across the country three months ago explaining the upcoming demise of bow tie manufacturing. This has been a particularly troubling time for Tucker Carlson. Carlson has spent the last six months in intense sessions with his therapist the entertainment trade magazines have been reporting. Carlson confirmed that he has been discussing this grave news with his therapist. It has also been reported that he has been negotiating with television stations in France where bow ties are still common. Negotiations have reportedly hit a snag because of the fact that Carlson does not speak French. Adding to the difficulty for his agent is the fact that the French are not interested in American politics or what Carlson has to say in any language. Carlson indicated that his therapist is helping him fashion an internal dialogue that involves ‘the good old days’. 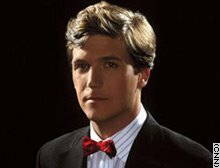 According to Carlson he has been hammering out stories that he will tell his children and grandchildren about the good old days of wearing bow ties. This is designed to help him embrace himself as a legacy and a historian to the young. Carlson’s wife painted a grimmer picture however. According to Mrs. Carlson, Tucker has been naming his bow ties and promising them that nothing will happen to them. After I promised not to ask about his youthful indiscretions in college, Mr. Carlson agreed to sit down for an interview. Me: Tucker, this must be a very dark time for you. How are you coping? Carlson: Some days are better than others, but in my darkest moment I am most shaken by knowing something very wonderful is going to come to an end and that I have absolutely no control of the situation. Me: Your discussions with Mr. Fuller apparently have not been successful, what is the most important thing you want to say to your fans. Carlson: I would like to say to my fans; if you see my name underneath my image then you need to be confident it is really me, bow tie or not. I may not act the same or look the same, but you will still know it’s me by my bewildered acceptance of attacks I can’t defend against. Me: Are you concerned that your fans won’t recognize you? Carlson: Of course, I am. However, I’m much more concerned that my family won’t know who I am when I come home. I mean, how would you feel if your wife said, “How do I know that is really you? Tucker began to sob quietly as his words trailed off…..
Me: Boy, those were the good old days weren’t they Tucker?